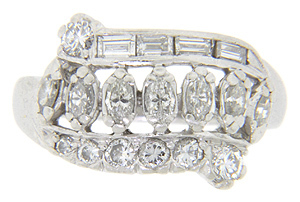 A row of marquis cut diamonds fills the center of this 14K white gold vintage wedding band. 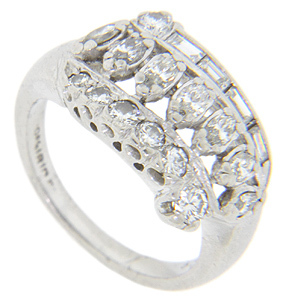 Each of the two edges is set with even more diamonds; one with a line of baguettes and the other with faceted round stones. 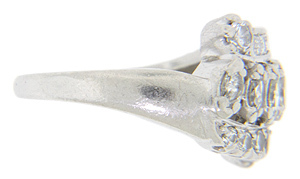 Approximately .40 carats total weight of diamonds are set in the ring. 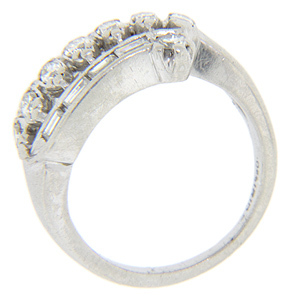 The ring measures 11mm in width. Circa: 1950. Size: 4. We can resize.